A special blend of three early season natural deer scent attractors. Buck and doe urine, buck preorbital, and interdigital gland scent, plus several different curiosity fixatives. Mystic Intrigue was developed to be an early season curiosity deer hunting lure. 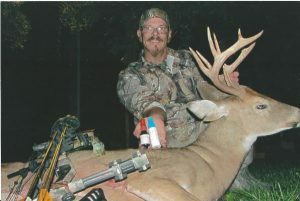 However, many hunters claim the combination of natural deer and curiosity scents prove to be attractive to both buck and doe the entire season. Lay a scent trail upwind from your stand and then hang scent wicks in a triangle around your shooting lane to carry the scent on changing air currents. Would like to that Paul Pollick for producing awesome scents. I have been using the complete scrape, buck interdigital, mystic intrigue, dominant buck and buck preorbital and have even getting amazing pictures of several bucks hitting my mock scrapes. On Friday November 9th I put flaming doe and buck tarsal in scent bombs and hung 5, took them down that evening when I got down and had 3 shooters show up in the food plot. The next weekend I was able to seal the deal as this 4.5yo 8pt came in grunting. I started using Mystic Intrigue last year for bow season. 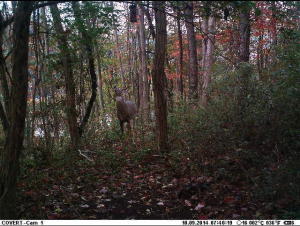 From using Mystic Intrigue last season and seeing the how the behavior of bucks react to it in the past, I knew it worked and I had to wait till a legal buck showed up. Although I did not get a buck last year, I had seen plenty of nonlegal bucks head straight towards these deer lures. I hunt the same spot every year and I know the patterns of the deer. I always setup in a funnel so I see plenty of does and buck traveling back and forth. The general rule of thumb for the area is that you see bigger bucks the last few weeks in October then they disappear once more hunters get into the woods. I can assume this period of time is the prerut as I don’t see chasing activity at that time. I hunt strictly from the ground and behind me there is also a funnel. This is area that is difficult to hunt since I sit with my back against a large oak tree and I cannot turn without getting noticed. To help with this problem, I added a 3D 12 foot X 54 inch blind behind me. I am able to see deer behind me and get into a better shooting position without getting noticed. Before I head into the woods to my spot, I put on my boot pads and spray Mystic Intrigue on them. I get within 20 yards of my spot and hang these boot pads on a tree branch in front of my spot. I also put the same lure in another shooting lane off to my left at 20 yards. With the use of the 3D blind, I added a lure 20 yards behind me. With the placement of these lures, I am right in the middle of a triangle formation with these lures. On October 26th, I had seen a large buck with another deer following him in front of me coming from the right and they were following their usual travel path. From hunting this same spot year after year, bigger bucks typically follow this path of travel going to the top of the flat to check on does. This year, there behavior was no different. I picked him up on the rangefinder at 34 yards. Knowing the typical pattern, I wanted a closer shot and I had very little time to get him into my shooting lane. At 20 yards, I gave him a quick grunt call. He turned and headed straight towards my deer lure. At that time, I had very little time to take a shot between two small trees. If he had taken one more step, he would have seen me and this is shown in the video. This is shown in the video. At 8:40am in Westmoreland County Pennsylvania, I was able to successfully harvest my first buck with a bow. He was a 10 point that weighted 191 pounds field dressed. 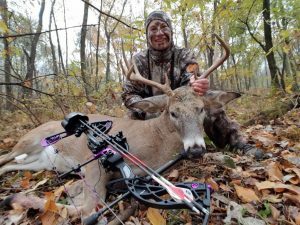 He is my largest buck to date and I was even able to surpass my dad’s largest buck from years ago in the Allegheny National Forest. I have not doubt that doing my homework, knowing the patterns of the deer and the use of Mystic Intrigue made my harvest a successful and memorable one. Next year, I am going to try and top this buck which won’t be an easy task. 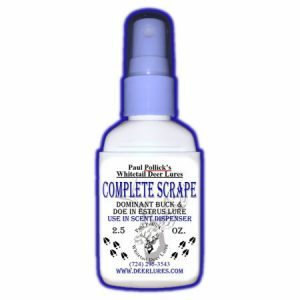 I am planning on using Paul’s Preorbital lure on a licking branch and Mystic Intrigue in an early mock scrape area which I will be starting in June or July. This will be monitored by a trail camera. In September, I am planning on using Complete Scrape under the Preorbital licking branch. I have nothing to lose by fine tuning my strategy next year. 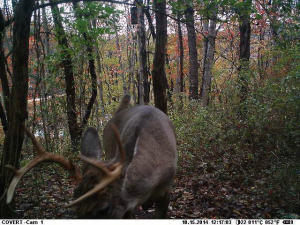 I do believe that there are bigger bucks in my hunting area. I just need to get them on camera, target a few and refine my strategy once I get more data. 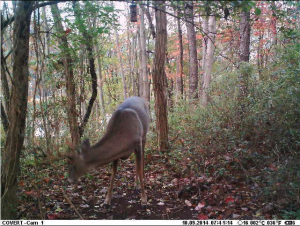 Pictures taken on Dan Sum’s trail camera reacting to a dripper containing Pollick’s Mystic Intrigue. The bucks lingered for 2 minutes. 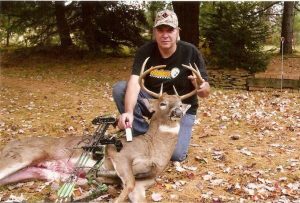 Paul, here are a couple of photos of bucks I arrowed while using your products. First, is a 10 point taken September 22, 2013 while using your Buck Preorbital & Mystic Intrigue. Second, is an 8 point buck taken on October, 28, 2014 while using your Buck Preorbital, Buck Tarsal, & Complete Scrape. I also used your Buck & Doe Tarsal wind checkers (I mixed them) and October Cover Mist. Two things I never start a season without: a well-tuned Hoyt bow and Pollick’s Preorbital. Thank you, Paul, for a great product! 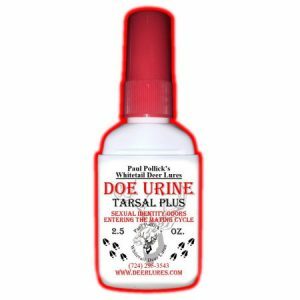 Your lures and scents are perfect for the dedicated bow hunter and bad news for whitetail bucks! 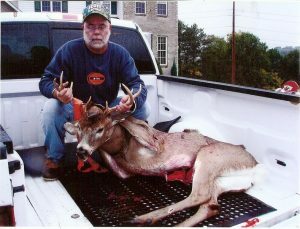 Here’s my 9 point buck (scored 131) that I shot in 2012 that I watched lip curl and come nearly 80 yards through the woods on a string to my scent wick sprayed with Mystic Intrigue. 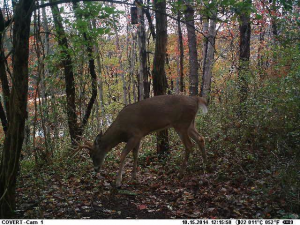 And this was in the heavy rut during VA’s November muzzleloader season. 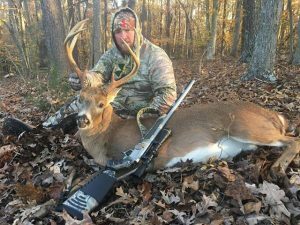 And my cousin, who lives in VA, shot 2 bucks ( 9 & 10 points) on the next two days, that once again came to the Mystic Intrigue scent wicks. Super good stuff!! I just ordered two more bottles. Dripper is full of your Mystic Intrigue and your Buck Preorbital Scent sprayed on the branches! 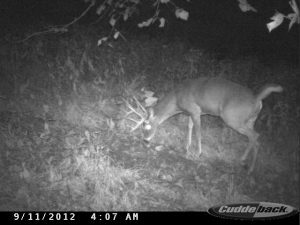 This was a mock scrape that I made but this buck has been keeping it clean! 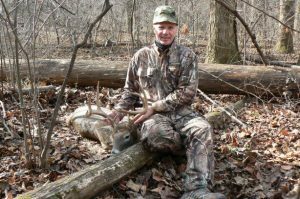 Pictured left: Mark Batchen’s 8 point. Pictured right: Gary Cochran. Both bucks taken with Pollick’s Mystic Intrigue.